There are moments in history, which define bands – and there are albums, which define moments. In 93, Sepultura were ready, willing and certainly able to make the leap from cult status to being major players on the metal scene. The build-up to Chaos AD had been steady. Sepultura broke out of Brazil with 89’s Beneath The Remains. Their third album, it marked the point at which they got international recognition – the Seps made their live debut in the UK that year at The Marquee in London, supporting Sodom – and in 91 the band took another step forward with Arise. This was to prove a crucial decision for Sepultura, because if Arise established the band’s rapidly rising cult stature, then what they had to do with the next album was definitely take what would have to be a significant stride forward if they were to break away from the new breed of thrashers. And the choice of producer was a key factor. It was Wallace who decided that the band should relocate to the celebrated Rockfield Studios in South Wales for the recording sessions, giving them a broader international perspective – and one that Kisser feels fitted the new attitude of the band. “You have to understand that we had spent two years touring with Arise. It was the first time that we’d seen the world, and actually could analyse and understand what it was like being Brazilian outside of the country. We saw Brazil from a different angle – one that changed the way we felt. Even with Arise, we were still writing lyrics that were very heavy metal, very based in fantasy. But now we began to get more social and political. We wrote about things that were going on in our country – the poverty, the repression – because these things made an impact on us. Musically, we’d also developed. We had learnt what worked, and what didn’t, from playing so much live, and getting to know people like Ozzy. We had made the jump from boys to men! Sepultura spent three or four months working on the songs for Chaos AD, the entire band relocating to Phoenix, Arizona. They all knew that this was to be their most challenging and important album to date, and believed they had to give it the maximum attention. Out of the writing process came some of the strongest material in the band’s history – hard hitting, powerful, challenging, confrontational. This was Sepultura on a new level. And when they went down to Rockfield, they weren’t just ready, they were focused and vibed in a way that had never previously been obvious. Inevitably, it was Max Cavalera who seemed to be the fulcrum of the band, the man with the off-the-wall ideas, and the vision to pursue them. For instance, there was the notion of recording in a castle! Kaiowas was just one of the surprises on this record, another being Biotech Is Godzilla, which saw Sepultura collaborate with Dead Kennedys’ Jello Biafra, an icon of the punk movement. “We had met Jello a little while before,” recalls Cavalera. “He was one of our heroes, and we thought it would be amazing to work with someone like him. I asked him if he’d like to come up with a few song ideas. And what happened was that Jello sent me these on a cassette. There were different songs, and I just chose Biotech Is Godzilla, because the title seemed so perfect – as soon as I saw it I thought that it just spoke of Jello Biafra. Who else would have come up with something like that? So we used that one. And if you listen to the version on Chaos AD you can hear Jello growling at one point. So, you pay your money and you take your choice – was it Max or the band in general who made that decision? But it wasn’t the only cover the band did during these sessions. So, Tony Iommi, if you’ve ever wondered why you were so short of guitar picks while making that album… now you know! “Everything about the album was right,” says Max. “The songs were right, the production was superb, and the mix really gave it punch. We had made the record we needed to make in order to establish ourselves. We all knew that we could never have done better. But did Sepultura realise just how successful it would become? The album was released with a huge fanfare in October, 93. Roadrunner Records, spared no expense on the launch, hiring the aforementioned Chepstow Castle for a massive party, to which various luminaries from the media and industry were invited to participate in a medieval style banquet. And the fans reacted with equal enthusiasm. The album sold briskly, outstripping previous sales marks across the world. In America, Chaos AD peaked at Number 32 on the Billboard Charts – a huge success. Eventually it would make the gold mark in the States, selling in excess of half- a-million copies – although it would take seven years to reach that landmark. In the UK, the album also achieved gold status, by selling more than 100,000 copies. “I think we proved a point to ourselves as much as anything else,” continues Cavalera. “We never had any doubts in our ability, but getting the chance to work with Andy Wallace, Jello Biafra and also Evan Seinfeld of Biohazard [he co-wrote the song Slave New World] allowed us to step up to a new level. 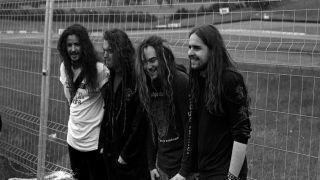 The Chaos AD tour saw the Seps become the first Latin band to play at the Donington Monsters Of Rock festival in 94 (joining the likes of headliners Aerosmith and Pantera). They also broke new ground with the first video from the album, Territory, which was shot in Israel. Yet, strange as it may seem, this also marked the beginning of the end for the band as fans knew and loved them back then. In 94, Max Cavalera married Seps manager Gloria Bujnowski; he also embarked on a side project with Fudge Tunnel’s Alex Newport called Nailbomb. These two events were to have massive repercussions within the seemingly impregnable Sepultura camp. But all of that lay in the future. At this period in time, the band could bask in effectively reinventing extreme metal for the post-grunge period. A quarter-of-a-century years ago, it seemed that Sepultura had indeed come up with a masterpiece. The passing of time has only accentuated its impact. What Reign In Blood was to Slayer and Master Of Puppets has become to Metallica, so Sepultura have the same relationship with Chaos AD. Can there be any higher praise?